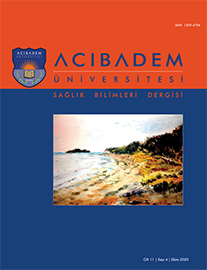 3Mersin University School of Medicine, Department of Statistics, Mersin, Turkey1 Objective: The aim of this study was to identify radiotherapy (RT) induced changes of masticatory muscles and parotid glands on magnetic resonance imaging (MRI) in patients with nasopharyngeal carcinoma (NPC). Patients and Methods: Thirty-one patients treated with RT for NPC between 2009-2016 in our instution were included in the study. MRI examinations performed before and after RT were reviewed retrospectively. Transverse diameters and signal intensities of masticatory muscles and parotid glands were evaluated on T2 weighted axial MR images. Normal (hypointense) signal was scored as 0, mild hyperintensity as 1 and severe hyperintensity as 2. Results: The mean interval between pre-RT MRI and last control MRI was 44 months (12-84 months). Reductions of transverse diameters were; right masseter (RM):2.32mm (15%), left masseter (LM):2.42mm (15.4%), right medial pterygoid (RMP):1.26mm (8.7%), left medial pterygoid (LMP):1.71mm (12%), right lateral pterygoid (RLP):1.35mm (9.6%), left lateral pterygoid (LLP):1.32mm (9.4%), right parotid gland (RP):8.22mm (26%), left parotid gland (LP):8.87mm (28%). T2 signal changes were; RM: mild 8 cases (26%), LM: mild 5 cases (16%), RMP: mild 5 cases (16%), severe 1 case (3.5%), LMP: mild 4 cases (13%), severe 2 cases (6.5%), RLP and LLP: mild 8 cases (26%), severe 3 cases (9.7%), RP: mild 10 cases (32%), severe 18 cases (58%), LP: mild 10 cases (32%), severe 17 cases (55%).